The Curtiss P-40 was a sturdy fighter and innumerable pilots owe their lives to its rugged quality. Remembered as a "best second choice," it served with twenty-eight Allied and friendly nations. If you can see the video controls but the video doesn't play click the link below. The Curtiss P-40 was a workhorse, much like the Hawker Hurricane and served in almost every theater of the Second World War. Both praised and vilified, the fact remains it bore much of the brunt of the air warfare over many battle fronts. For lack of a dependable supercharger,1 it was designed as a medium-altitude fighter making its performance less than desirable. Compared to the Mitsubishi Zero and Messerschmitt bf 109, it was for all practical purposes outclassed as soon as it came off the assembly line. However, it was available in quantity and its shortcomings were partly compensated by its docile flight characteristics, and sturdiness which enabled it to withstand a considerable amount of punishment. Developed from the Curtiss P-36 Hawk, the inaugural flight of the XP-40 was on October 14, 1938 and it offered little improvement over the P-36 design except for a streamlined nose with the installation of the Allison V-1710 inline engine. In fact, the prototype was actually constructed from the tenth P-36A airframe. Since it was readily available for mass production, it was chosen over the Lockheed XP-38 and Bell XP-39 during the US Army Air Corps pursuit competition held on January 25, 1939. Cost was also a factor. The P-40 cost about $53,000, the P-39 was $71,000 and the P-38 cost $126,000.2 However, the purchase of thirteen each of YP-38s and YP-39s were approved the same day. In the early 1930s, no prospect of high-altitude attack was envisioned for the USA. In 1931, bomber and pursuit aircraft performance were just about on par with each other and the Boeing B-9 Bomber was faster than any other bomber in the world. It was so fast that existing American fighters had trouble intercepting it. The B-9 had a maximum speed of 188 mph (302 km/hr), while the Boeing P-12E pursuit airplane had a speed of 189 mph (304 km/hr) and the Curtiss P-6E Hawk could do 197 mph (317 km/hr) only under ideal conditions. When the Boeing P-26 Peashooter made its first flight on March 20, 1932, it could exceed speeds over 200 mph, but it still had an open cockpit and fixed landing gear. The P-26 became outmoded with the introduction of the Martin B-10 which had an enclosed cockpit with retractable landing gear and a top airspeed of 234 mph (377 km/hr). It wasn't until the Seversky P-35 won the in the 1935 fighter design competition that pursuit aircraft were approaching speeds of 300 mph. This made it apparent that the USAAC strategy was becoming out-of-date which emphasized costal defense and ground attack, and the Bell P-39 Airacobra and P-40 were envisioned as low-altitude aircraft for ground support operations. This is not to say the US strategy was completely wrong, because when World War II began, the Boeing B-17 Flying Fortress was the only strategic bomber available when the war began.3 So in May 1939, as the winds of war were approaching, the Army ordered 524 production P-40s which was at that time the largest-ever production order for a US fighter, totaling nearly $13 million dollars. As a result, during the early part of World War II, the P-39 and P-40 comprised of more than half of the USAAF fighters committed overseas.4 However, by July 1943, as superior fighter deliveries increased, only one P-40 group remained operational in July 1945. The modified Curtiss XP-40 had the radiator moved from the rear fuselage to the nose. The P-40's roots date back as far as 1924 with the famed Curtiss Hawk fighters being the best all around US pursuit aircraft. In 1933, after the Curtiss Model 66 lost to the Boeing P-26 during a USAAC fly-off, Curtiss was determined to retain its dominance as an Army Air Corps contractor and hired Donovan R. Berlin as Curtiss� new chief engineer. Berlin had previously worked at Douglas and Northrop, two firms that had been at the cutting edge of aircraft design. The result was the Model 75. Originally the Model 75 was rejected in favor of the Seversky P-35, but in 1937 Curtiss was awarded a contract for 210 Model 75s, designated P-36As, which was the largest US military airplane order since the first World War. The Model 75 airframe was then adapted as the XP-37 with an Allison V-1710-11 engine with a General Electric turbo-supercharger. Thirteen YP-37s were ordered for evaluation, but the supercharger proved troublesome and was likely to catch fire. Due to supercharging reliability issues, it was ultimately decided that the XP-40, Curtiss Hawk, Model 81, would use a 1,160 hp (865 kW) Allison V-1710-19 engine with a mechanical supercharger. Although an inline engine offered better streamlining, more power per unit of frontal area, and better specific fuel consumption than did air-cooled radials of comparable power, the rated altitude of the Allison engine was only some 12,000 feet, rendering combat above 15,000 feet unfeasible. Given the limits of technology at the time and an outmoded pursuit aircraft strategy, the achievements of the P-40 become all the more remarkable. In 1939, the National Defense Act called for 5,500 airplanes for the Air Corps, but in May 1940 President Roosevelt raised the total number of planes to 50,000, which was considered an impossibly over optimistic number at the time.5 During the first years of the war, P-40s made up a large part of the orders for aircraft, with Britain and France also ordering P-40s to contend with the German Luftwaffe, but in the case of France, deliveries came too late and their P-40s were diverted to the Royal Air Force—to be known as Tomahawks. Similarly, the Soviet Union's outdated air force had fared badly at the hands of the Germans, and P-40s were also sent there. The P-40 would become the third most American fighter produced during World War II, after the P-51 and P-47, with 13,738 P-40s built.6 * By the end of the war, the US had produced more than 300,000 aircraft overall. One hundred and ninety-seven P-40s were built in 1939-40 for the USAAC and many more were sold abroad to Britain and France. However, France capitulated before they accepted delivery and 140 aircraft were diverted to the RAF and designated as the Tomahawk Mk. I. The Tomahawk Mk. IA, and IB, carried two Browning .303 caliber machine-guns in place of the .30 caliber guns fitted in USAAF machines. It retained the standard synchronized armament of two .50 caliber machine guns in the nose. The P-40 was a relatively clean design and it was unusual for its time in having a fully retractable tail wheel, but one of the most significant steps in P-40 development came in 1941, when a British-built Rolls-Royce Merlin 28 engine with a single-stage, two-speed supercharger was installed in a Kittyhawk I airframe to improve its high-altitude performance. The Curtiss H-87-D, or XP-40F, as the Merlin-powered prototype became to be known then, had 1,300 hp (970 kW) available for takeoff, and 1,120 hp (835 kW) at 18,500 ft (5,640 m), which offered vast improvements over earlier models and endowed a maximum speed of 373 mph (600 km/h). This was reduced slightly in the YP-40F, which, like later variants, had the Packard-built Merlin V-1650-1 and revised cooling, the air intake above the cowling being incorporated in the radiator scoop. Gross weight climbed to 9,870 lb (4,475 kg). 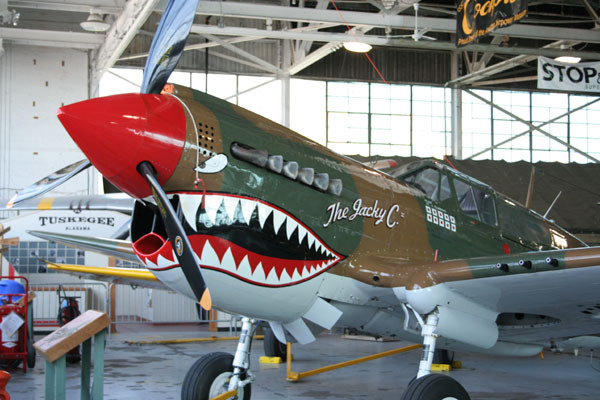 The first major change in design came with the P-40D, Model H-87-A2. It was powered by a shortened 1,150 hp Allison V-1710-39 engine with an external reduction gear, raising the thrust line and shortened the overall length by 6 inches. The cross-section of the fuselage was reduced and the landing gear was shortened. The radiator was increased in size and moved forward slightly. The nose guns were removed and four .50 caliber machine guns were placed in the wings. There were provisions for an external center-line fuel tank or 500 lb bomb. Gross weight increased to 8,670 lbs and the max speed was published as 360 mph. However, the climb rate and ceiling was still relatively poor. Following experiments in cooling-drag reduction in 1943 with a P-40K-10-CU which had its "beard" radiator removed to wing installations, and rear vision improvements by installing a "bubble" canopy on a standard P-40L, a general "clean-up" program was initiated, resulting in the sole XP-40Q. With a 1,425 hp (1,060 kW) Allison V-1710-121 engine, the XP-40Q was modified from the first P-40K-I to have a "bubble" canopy and cut down rear fuselage, wing radiators and, eventually, clipped wing tips. A four-blade propeller was fitted, and water injection installed. With a weight of only 9,000 lb (4,080 kg), the XP40Q attained a maximum speed of 422 mph (680 km/h). This was still less than the speed attained by contemporary production P-51 Mustangs and P-47 Thunderbolts and the XP-40Q did not go into production. Many US volunteer pilots flew on behalf of Britain, the Soviet Union and China before the United States entered the war. Equipped with P-40s, a group known as the 'Flying Tigers', because of their uniquely painted aircraft, helped the Chinese in their struggle against the Japanese in 1942. This group later became part of the USAAF proper, and P-40s were thereafter used widely in the Pacific. The Flying Tigers adopted the shark mouth markings from Tomahawks of the British No. 112 Squadron. In the middle of 1941 General Claire Chennault began recruiting for his Volunteer Group—better known as the Flying Tigers—to fight the Japanese from China, for which one-hundred P-40s were ordered for purchase through a loan from the US Government. Ninety aircraft, mostly P-40Bs, were actually delivered, sufficient for three squadrons, plus a few spares. At the time of the USA's entry into the war there were eighty American pilots in the Volunteer Group, and shortly after arriving at Kunming the P-40s drew first blood, six out of ten attacking Japanese bombers being destroyed by two of the AVG squadrons on December 20. There were no American casualties on this occasion, but the third squadron, left behind at Mingaladon, Burma, was less fortunate, and lost two pilots on their first interception, on December 23, 1941. The American pilots had underestimated the maneuverability of the lightly built Mitsubishi Zero fighters, and failed to utilize their superior speed and diving ability to advantage. It was soon the cardinal rule that a P-40 should always avoid mixing it individually with a Japanese fighter, owing to the Curtiss machine's inferior climb rate and maneuverability, but the P-40 substantiated a reputation for ruggedness that it was already acquiring with the RAF in the Middle East, and its armor protection saved many AVG pilots in subsequent combat. Both the Flying Tigers in China and the RAF squadrons in the Middle East had their P-40Bs replaced by P-40Es. After continuous operation, the AVG was down to some twenty P-40Bs by March 1942, when some thirty P-40Es were ferried to China by air from Accra, in Africa. The improved performance offered by these more potent P-40s was found to be extremely valuable against Zeroes , which were introduced in the Chinese theatre in 1940. The ground-attack potential of the P-40E was also much superior. The AVG pilots had resorted to carrying 30-lb. incendiary and fragmentation bombs in the flare chutes of their P-40Bs, but it was questionable whether this was not more hazardous to the attackers than to the attacked. But some indication of the P-40's capabilities in resolute hands is given by the fact that from its inception in December 1941 until July 4, 1942, when it was absorbed by the USAAF, the AVG was officially credited with the destruction of 286 Japanese aircraft for the loss of eight pilots killed in action, two pilots and one crew chief killed during ground attack, and four pilots missing. The top-scoring AVG pilot, Robert H. Neale, was credited with the destruction of sixteen enemy aircraft while flying the P-40, and eight other pilots claimed ten or more victories. 1. Ray Wagner. American Combat Planes. Garden City, New York; Doubleday & Company, Inc., 1982. 252. 2. Enzo Angelucci and Peter Bowers. The American Fighter. Sparkford, Nr. Yeovil,Somerset BA22 7JJ; Hayes Publishing Group, 1987. 162. 3. Herbert M. Mason, Jr. The United States Air Force, A Turbulent History. New York: Mason Charter, 1976. 119. 4. The United States Army Air Corps (USAAC) became the United States Army Air Forces (USAAF) on June 20, 1941. 5. John T. Correll. The Air Force on the Eve of World War II. Air Force Magazine. October, 2007. 6. Peter Bowers. Curtiss Aircraft, 1907-1947. Annapolis Maryland; Naval Institute Press, 1987. 479. * Sources for production numbers differ. In Famous Fighters of the Second World War, page 49, by William Green, production numbers were listed at more than 14,000. Other sources put the total production numbers above 15,000. Created October 11, 1996. Updated November 27, 2018.